Red Lining, a discriminatory practice by which banks, insurance companies, etc., refuse or limit loans, mortgages, insurance, etc., within specific geographic areas, especially inner-city neighborhoods, has long been a practice in Grand Rapids. One recent example if that of Mercantile Bank, which is being sued by several Black business owners who believe that the bank purposefully withheld loans and caused them to go out of business. Todd Robinson, in his important book, A City Within a City: The Black Freedom Struggle in Grand Rapids, Michigan, documents the practice of red lining that primarily impacted the Black community beginning in the 1920s. 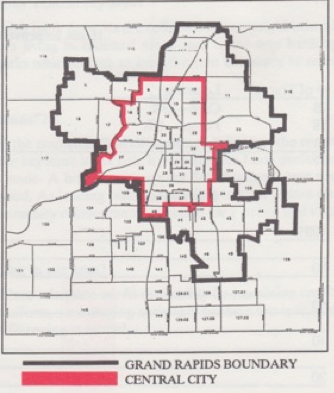 Pictured here is a map from the Home Owner’s Loan Corporation (HOLC) from 1937, that demonstrates where red lining was taking place in Grand Rapids. To understand the color coding, go to this link http://www.historygrandrapids.org/tilemap/2596/the-holc-map. In 1991, a group calling themselves the Coalition for Community Reinvestment (CCR) produced a pamphlet that provides data on the practice of red lining in Grand Rapids, plus information and resources on how to fight red lining. In the map shown here, one can see the area of Grand Rapids they have identified as being impacted by red lining practices. The data they provide in their pamphlet also shows that of all the mortgage loans providing by banks/lending institutions in 1991, only 8% of loans were provided for people wanting to purchase a home in the core area of Grand Rapids. 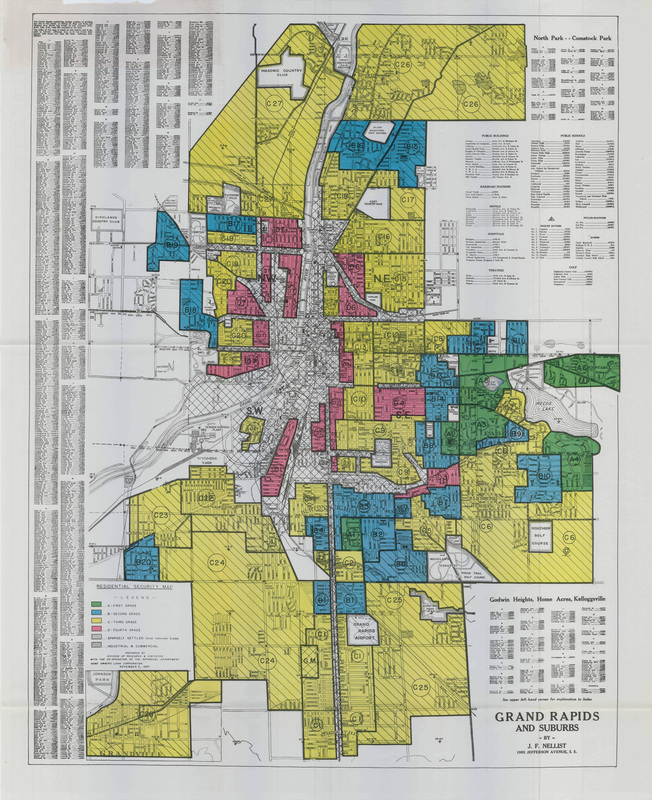 Looking back at the history of red lining in Grand Rapids is important, not just for understanding what has happened in the past, but to see the connection to what is happening now. There is a current “housing boom” in Grand Rapids, but very little of it is affordable housing. Therefore, we always have to ask ourselves, Who Benefits from from the current housing projects? In many ways, this so called housing boom is just the latest version of red lining that continues to marginalized communities of color and working class people in the Greater Grand Rapids area. 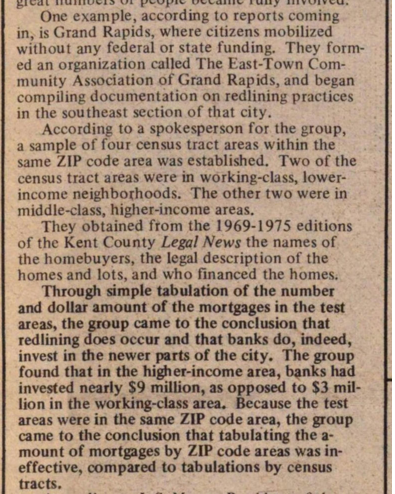 This entry was posted in Civil Rights/Freedom Movement, Neighborhood organizing and tagged history of red lining in Grand Rapids, racism in Grand Rapids, red lining in Grand Rapids, so-called housing boom in GR. Bookmark the permalink.